Wednesday, May 22, 2002 - 1:00 P.M. The Washington High School Research History Class has worked hard for several years trying to document all of the USCT buried in Ohio. It has been a long and exhausting journey but well worth the effort. Recently, they have taken on a new project to further honor these men. The class has decided to replace some of the markers, in Washington Cemetery and clean the ones that were damaged. The project, beginning in Fall of 2001, involved much paperwork. 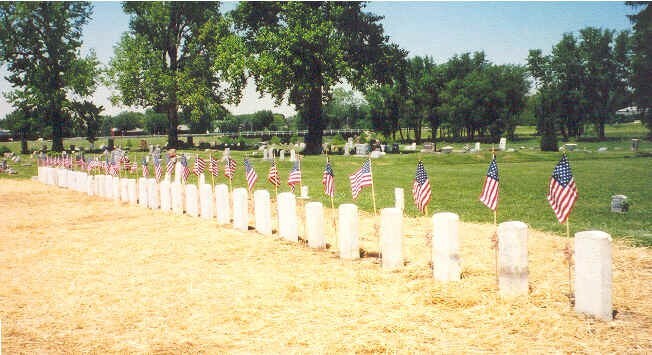 Mark Bihl, Alan Henderson, Bryan Young, and others spent hours working at the Washington Cemetery with the cemetery superintendent, Rankin Kirkpatrick. 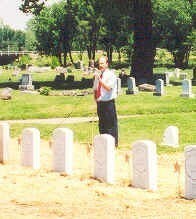 The students were given a list of soldiers buried in the cemetery by the class advisor, Paul LaRue. They spent their time getting information on the soldiers and filling out forms to prove who was buried in the cemetery. During this process, Bihl was in contact with Washington, DC. He had to know when the markers they ordered from the government would be in so that he could be there to check them off. After all of the markers had arrived, the class began to make frequent trips to the cemetery. The initial trip was to dig out the old markers. This was quite a task for the students, as each of the markers weighed approximately 250 pounds. They first dug out around the marker until it could easily be moved. Once this step in the process was done, the cemetery workers evened out the ground to prepare it for the new stones. The next couple of trips for the students involved loading the new markers on a truck to be moved to Section Thirteen. 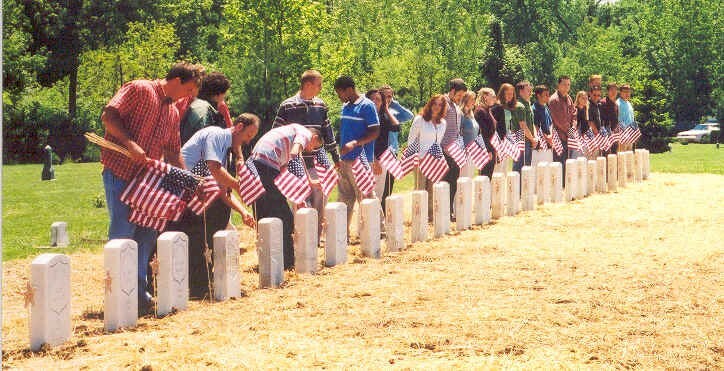 Once all of these things had been completed, the markers were ready to be set, The entire class spent a day at the cemetery digging holes and setting markers. It was a sweltering day outside, and the holes had to be perfect. The students didn't complain, however, and ended up setting the majority of the 35 markers. Several more trips followed, in which they finished setting the stones to complete "Soldiers' Row." 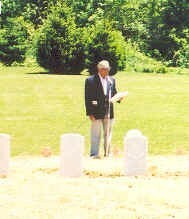 This is the front row of Section Thirteen where most of the USCT are buried. The old markers soon received attention, as they were in need of cleaning. For a few of the students, this was the fun part. Kirkpatrick brought the power washer to Section Thirteen, and they all began to clean. Soon the old markers looked brighter and newer. A few more trips followed this one for the finishing touches. The class has worked hard this year to honor these soldiers. They have learned a great deal about their local history, and they are proud to represent the community. Their greatest reward has been providing a proper memorial for the soldiers who had been forgotten. It is a honor and pleasure to have been invited to participate today in this historic event. FIRST - I extend my appreciation and thanks to the Research History class of Washington High School for their dedication and extremely hard work in uncovering, documenting and honoring those whose history had been lost. And to Mr. Paul LaRue for his leadership and foresight. More on Mr. LaRue and the members of the class later. Your research and accomplishments motivated me to look into other aspects of this history which I will share with you today. On this date, May 22, 1863, 139 years ago Assistant Adjutant General E. D. Townsend, by order of the United States Secretary of War, issued GENERAL ORDERS No. 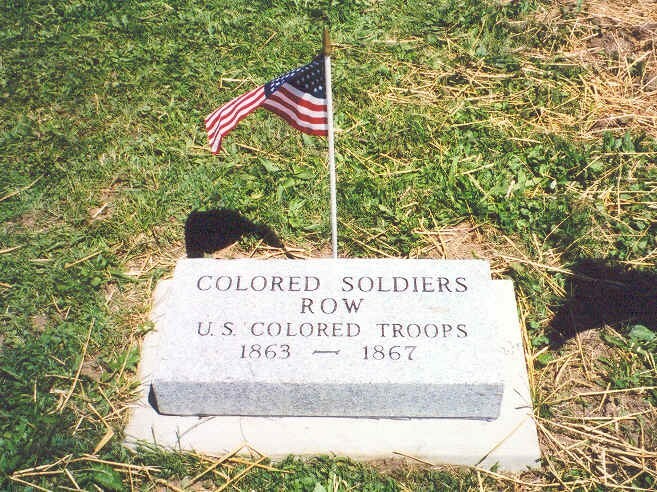 143, that authorized the formation of the Bureau of United States Colored Troops. This order officially began the recognition of the black soldier in the U. S. Army. Men became part of the U. S. Colored Troops in three ways: redesignation of state volunteer regiments, redesignation of the Native Guards and Corps d'Afrique, organized in Louisiana and via the draft, enlistments, or as substitutes. This resulted in the organization of over 180,000 men in over 160 regiments that constituted 10 to 12 percent of the Union Army. The vast majority, approximately 135,000 to 140,000 came from the states that had seceded and the border states which were also slave states. Four states, Louisiana (24,000), Mississippi (18,000), Kentucky (23,000 and Tennessee (22,000), were credited with furnishing approximate 87,000 men. So as you can see the majority of these soldiers were ex-slaves. Subsequently, all regiments, USCC (Cavalry), USCI (Infantry), USCHA (Heavy Artillery) and USCLA (Light Artillery), were assigned numeric designations except the 54th and 55th Massachusetts Volunteer Infantry Regiments, the 5th Massachusetts Colored Cavalry Regiment and the 29th Connecticut Volunteer Infantry Regiment. There were 449 engagements of which 39 were considered to have been major encounters with the enemy. TIME WILL NOT PERMIT A MORE THOROUGH ANALYSIS AND REVIEW OF THOSE RESTING HERE AND THEIR UNITS. However, I will briefly share some interesting information with you today and mention a few names. The 39 veterans listed on your web site served in 17 different regiments that were organized in PENNSYLVANIA, OHIO, MARYLAND, VIRGINIA, KENTUCKY, TENNESSEE, MISSISSIPPI AND LOUISIANA. The men served and participated in combat activities from Virginia to Texas during and after the Civil War. Eight of the regiments was assigned to the Army of the James and participated in the Seize of Petersburg and Richmond, Virginia (5th - 9th - 23rd - 27th - 45th - 109th - 116th - 117th). Towards the end of the war, the regiments were assigned to the newly organized XXV U. S. Army Corps, the first and only Army Corps in the history of the country made up entirely of Colored infantry regiments. The 5th, 9th, and 45th were three of thirteen USCT regiments in the Battle of New Market Heights, just outside of Richmond. Fourteen Medals of Honor were awarded, including one officer and four Sergeants with the 5th USCI. NOTE: The Sergeants were Milton Holland, James Bronson (J. C. Anderson - Co. D), Powhatan Beaty (Nelson Spears - Co. G), and Robert Pinn (Clarence Powell – Co. I). Five regiments (45th - 23rd - 109th - 116th - 117th) played a significant role in the pursuit of General Lee's Army westward from Richmond and Petersburg and subsequent surrender at Appomattox. The 116th was one of seventeen regiments deployed along an assault line west of Appomattox that moved eastward and prevented General Lee's Army from escaping westward. The 45th along with other regiments were assigned positions in the rear of this line. 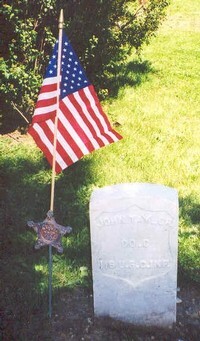 NOTE: John Taylor was in Company C of the 116th and 8 others resting here were in the 45th. The 5th USCC participated in the southwest Virginia campaign - Saltville, twice, and Marion. After the war ended the regiment was deployed to Arkansas to chase and capture bushwhackers. NOTE: Samuel Evans was assigned to Company E of the 5th USCC. The 16th and 100th participated in the Nashville, Tennessee campaign. Wilson Bunch served in the 100th and Isaac J. Peterson was with the 16th. The 5th USCHA was involved in expeditions in and around Rodney, Fayette, Vicksburg and Yazoo City, Mississippi. The regiment is believed to have had the highest number of losses of any regiment in the Union Army - 4 officers and 124 enlisted men killed and mortally wounded, and 697 enlisted men died of disease for a total of 825. NOTE: It is believed Joseph Gales (Gailes) and John Hampton were recruited from the local area, traveled by boat down the Ohio and Mississippi rivers to Mississippi and Louisiana, and returned back home after the war. Also after the war ended 7 regiments were deployed to Texas due to unstable conditions that existed in Mexico that some thought would eventually spill over into Texas. The units were stationed at Indianola, Brownsville, Brazos Santiago, and on the Mexican Frontier along the Rio Grande river. ONE CAN ONLY IMAGINE THE GREAT EXPERIENCES AND STORIES THAT WERE SHARED BY THESE MEN WHEN THEY ATTENDED GAR (Grand Army of the Republic) MEETINGS here at Washington Courthouse or when reminiscing one on one or in groups from time to time. IN CLOSING - The best of luck to the entire class as you move on to further studies and careers. I can envision great things from all of you because you volunteered to take on a difficult task and succeeded in uncovering missing links of our history. If I may quote Ashley Woods from a newspaper article when she said, "I think it would be too easy if we were doing Caucasian soldiers." "They're so well documented and the USCTs aren't". In other words you all decided to take on a difficult task and succeeded. That statement by Ashley and what you accomplished say a lot about the type of students you are, your work ethics, character and determination, which will carry you to many other great accomplishments in the future. To Mr. LaRue, please continue to teach, direct and give guidance to your students in future research history classes. You are standing high on a pedestal all along. I am hoping you will be emulated so others will be able to join you at the top where I am sure it gets pretty lonely. 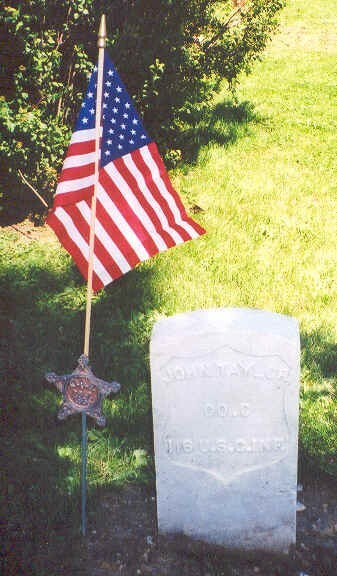 John Taylor, 116th United States Colored Infantry Regiment, ancestor of Stephen Jackson, a member of the 2001/02 Research History Class.